I’ve never been crazy about Valentine’s Day — I, like many others, find it to be too contrived a holiday. So while I’ve often eschewed it, I found it strange that February 14th was not a big deal here. No huge displays of chocolates (well, I guess I mean to say that the chocolate aisle remained unchanged), no signs exhorting you to show your love by buying your sweetheart something. In my efforts to become a better cook, I’ve been following a number of baking and cooking blogs, and these were all atwitter at the holiday. They featured pastas, and brownies and cookies and candies…oh my. I got a bit caught up in their spirit, and decided that I would celebrate Valentine’s Day by baking and cooking, and thereby killing multiple birds with one stone: earning hausfrau brownie points; reconnecting with my heritage (ha); working on my kitchen skills; creating something that Stelian would hopefully enjoy (dinner), and something that I would enjoy (dessert). I decided on the recipes – a pesto cheese pasta bake for dinner, and a carrot cake for dessert. I set off to the grocery store with a mile-long list of items, and luckily found everything I was looking for (though there were some tense moments, such as when I had difficulty differentiating baking powder and baking soda — it would have made good TV, I tell you!). I then spent the entire afternoon working on the damn cake, which didn’t turn out as I’d have liked. Some of you may ask, why was I making a carrot cake anyway? Isn’t chocolate what’s called for by the holiday? Well, yes…but Stelian and I both like carrot cake, and I am irreverent about holidays as I am about everything else. Okay, there’s more. In one of the major supermarkets in Zürich, they sell the most adorable little marzipan carrots. I was just waiting for an opportunity to use them. That opportunity could only involve carrot cake. You have to create your own destiny, you know? I would say I’m an intermediate baker. I have no problem with techniques like creaming and folding. The carrot cake recipe was not difficult, and the batter looked perfect. But then I realized that I couldn’t fit two cake pans into my small Swiss oven. And then I transferred the batter to a springform pan, whereupon it began leaking everywhere. So I resorted to pouring all of the batter into a square pan, where it formed one ridiculously thick layer that I thought I would have to cook forever. Things went further downhill when I attempted to make a cream cheese frosting sans handmixer. I’ll spare you boring details, but let’s just say I ended up with an overly sweet and still too runny frosting. Ick. So, in the end, we had a perhaps-not-quite-cooked-in-the-middle carrot cake with runny, cloyingly sweet frosting. But the marzipan carrots looked great. See? And in other news, I nailed the pasta. Okay, the recipe probably deserves some credit. And because I dithered over the cake the whole afternoon, Stelian was there to help me cook it. But I still choose to believe that I’m becoming a better cook. I think this is my first time liking dinner more than dessert…who knows what might happen now. I could become one of those people who crave potatoes and appreciate bacon! Well…maybe not. But I will consider laying off the fancy baking and just buying some chocolate for dessert next year. Categories: Expat experience, Food, Swissness | Permalink. 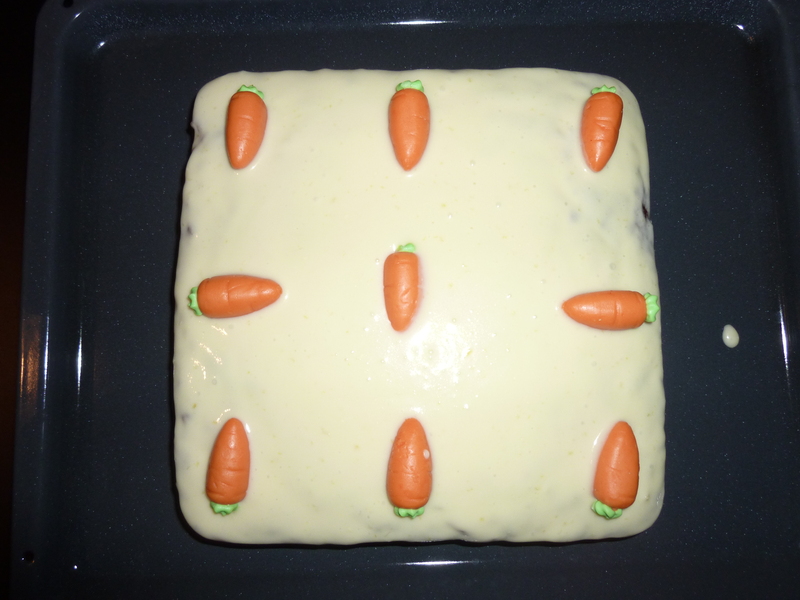 Marzipan carrots on carrot cake: genius! Nice touch 🙂 I am going to load up on marzipan when I visit Zurich.